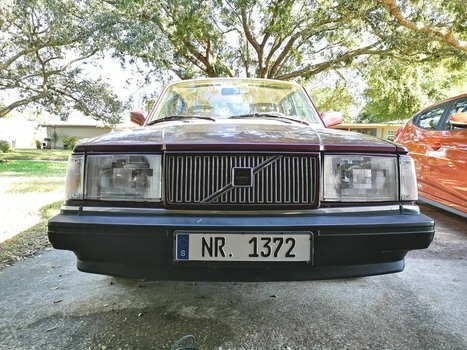 Suffering from yellowed headlights on your Volvo 240? You can polish them to restore their original look but the yellowing will return about 6 months later. 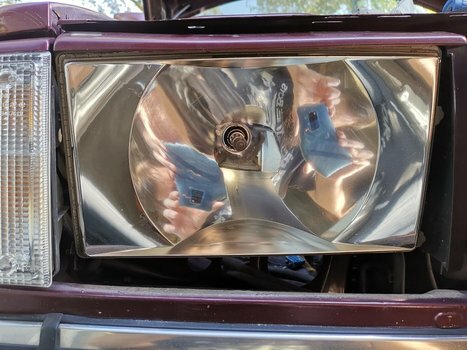 Aftermarket lights are fairly cheap (Around $150 for the pair when I did mine) so I figured I'd just replace them. 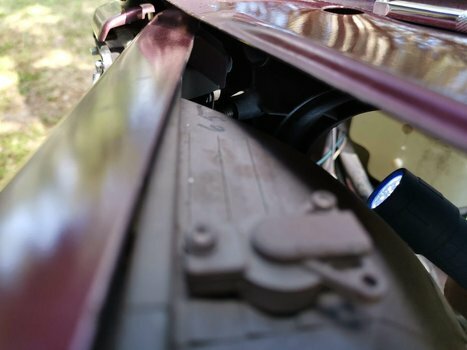 If your car doesn't suffer from any rust issues this may be a very simple job. In my case I wasn't so lucky, and had to drill out some stuck bolts making the task more difficult, but not impossible. In either case, read on to see how it's done. 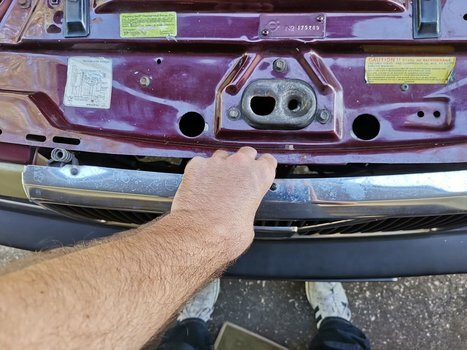 If you suspect you may run in to rust I recommend spraying the nuts holding the headlights in with PB Blaster ahead of time. PB Blaster can penetrate the nuts and may help them break free. There should be three on the driver's side and four on the passenger side. Liberally spray these and let them soak overnight, if possible. 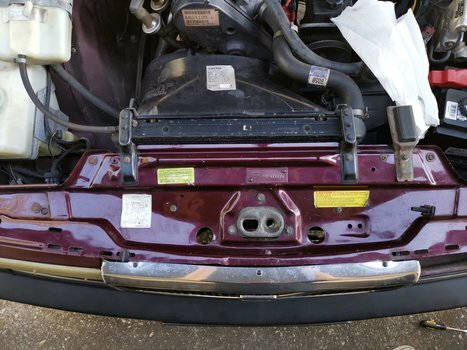 Start by removing the grill. There are two plastic clips. Turn each one turned 90 degrees, then pull them out. With the clips removed you can maneuver the grill out of the way. 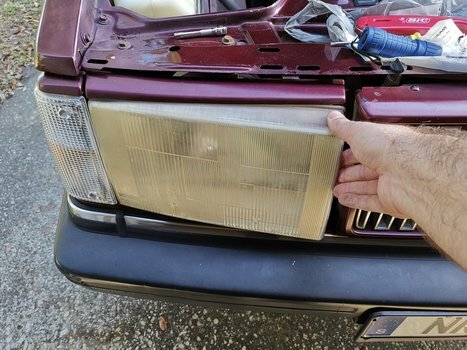 Remove the bulb by twisting the bulb housing, then pulling way from the headlights. Note below the nuts that are screwed on to these bolts. These are what you need to remove. Ideally these nuts can simply be socketed off. If so, skip the section below and move on to the next section. 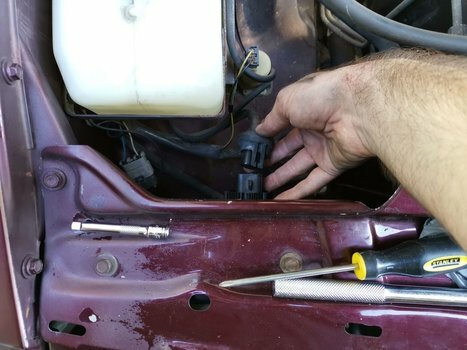 If you're unlucky, one or more bolts will start to spin in place and you won't be able to get the nut removed. If that's you, then read the next section below. 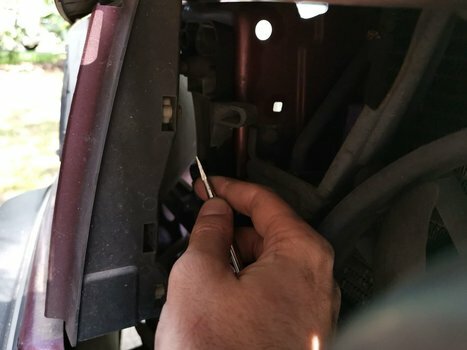 The problem arises because the bolt is attached to a plastic frame that contains the headlights. 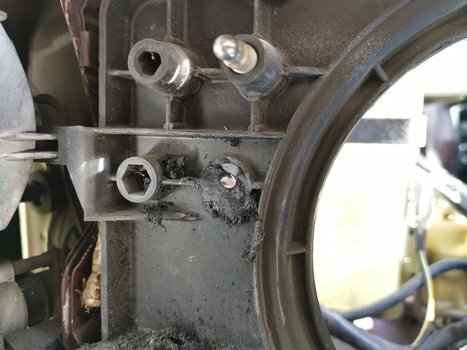 When the nut and the bolt are fused together with rust then applying torque on the nut simply causes the bolt to strip out of its plastic housing. 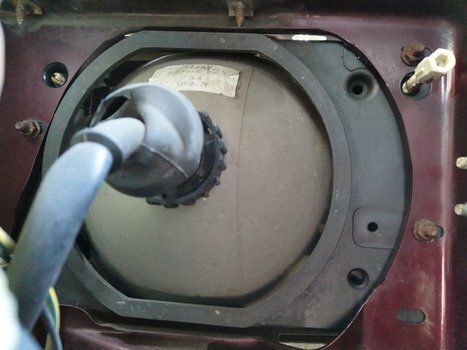 At that point the bolt is free to spin and the only solution is to cut the bolt or nut away. 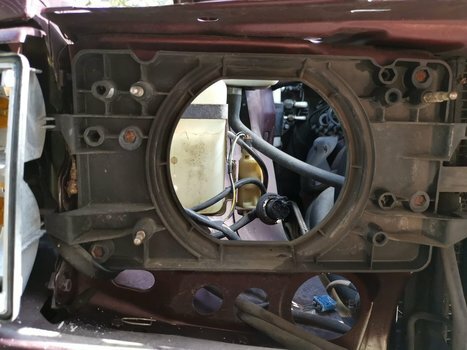 The solution is to remove the pieces of the headlights from the exterior of the car in order to get to the plastic frame shown above. Then you can drill out the rusted bolts. 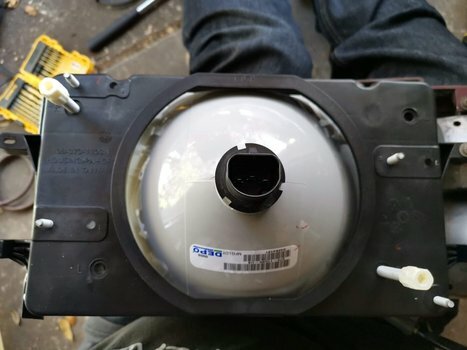 Once drilled out you can finally free the old plastic frame, allowing you to attach the new headlights. Alternatvely you can try cutting the nuts, however I opted not to do this as I didn't want to damage the frame of the car. Start by pulling out the old plastic lens. On my car the adhesive and rubber was fairly deteriorated so this was easy to just yank out. If you encounter resistance then you may need to try prying the lens out with a flat screwdriver. 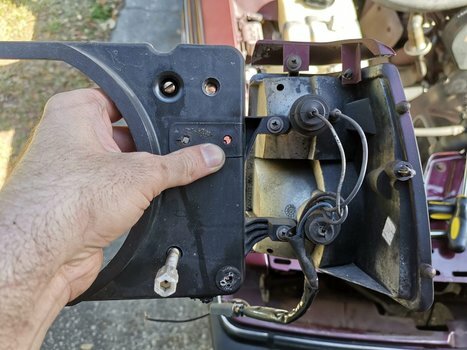 You can expect to need to remove 3 or 4 clips per headlight. Start by removing clips close to the grill opening. Those will let you to more freely move the reflective housing, allowing you to hinge it in order to get access to the other clips. These clips don't need to be saved, so use liberal force to bend and remove the clips. It may take a little creativity and force but eventually you should be able to pull off all of the clips. 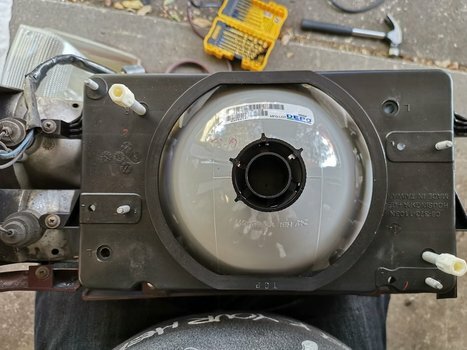 Once removed, pull the reflecting housing away revealing the plastic headlight frame. 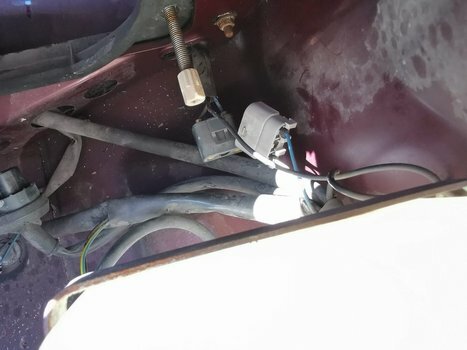 Now you'll need to remove these bolts. I ended up using two strategies, starting with drilling. 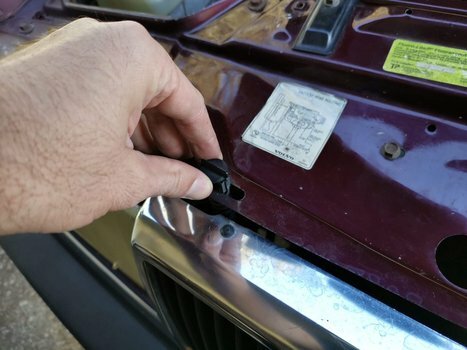 Take your screwdriver and drill into the back of the bolt with a small drill-bit, then change to a larger bit and continue to drill into the bolt. Drilling out bolts is not a fun and clean process. In my case, I ended up breaking a few drill bits. The slower and more methodical you are the better off you'll be. Eventually your drill will go so far in the bolt that it may break the nut off. In my case this worked for about half of the bolts. The others were being very stubborn, so I switched to a dremel. The plan is to take a dremel with the disc bit and cut the head of the bolt off. 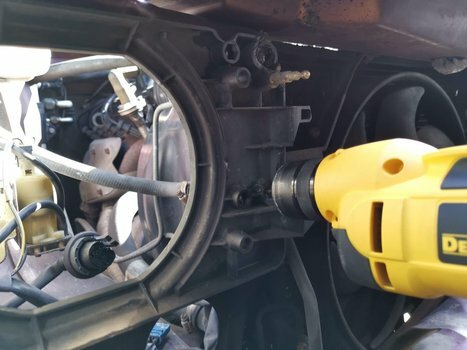 The bolts are sunk into the plastic headlight frame so you'll need to cut at the plastic to get to the bolts. 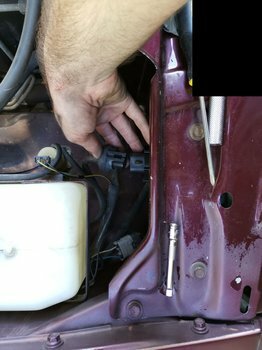 Once you begin cutting into the bolt you can switch to your hammer and apply some liberal force in hopes to shear the bolt head off. Alternating between the dremel and hammer should eventually do the trick. 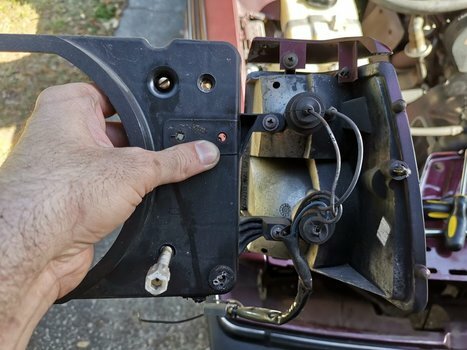 If cutting the passenger side bottom right bolt be careful not to cut into the cable for the blinker and side-marker lights. In my case my headlights put up a good fight but eventually lost to a combination of drilling, hammering and cutting. Pull the headlights away from the car. 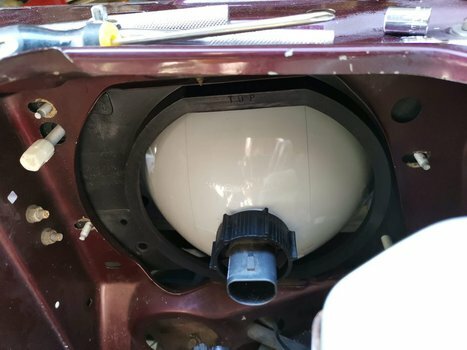 The side marker and blinker light assembly is attached and will come with the headlights. 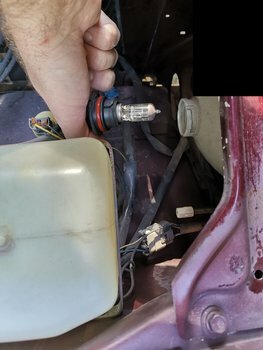 Unscrew the blinker assembly (held in by two phillips-head screws) from the old headlights and attach to the new headlights. 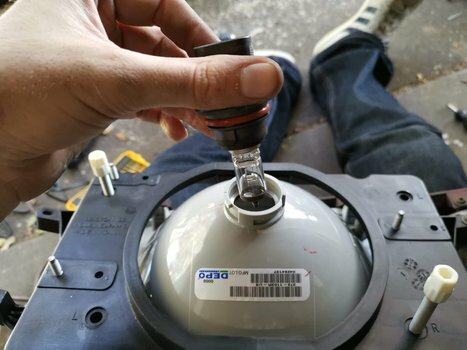 Insert the bulb and bulb housing into the new headlights. Thread the bolts of the new headlights through the holes in the frame. Thread washers and screw the nuts on the bolts to attach the headlights to the frame. In my case the existing nuts were cut or rusted so I had to use new ones. 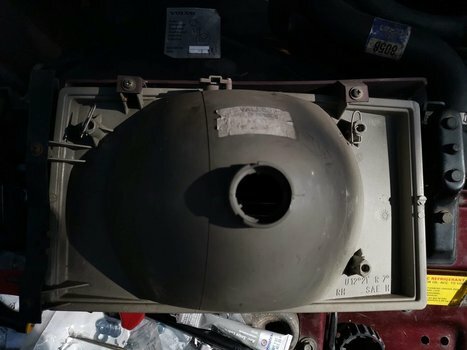 My new headlights did not come with nuts, and the bolts with the new headlights did not match the old headlights. In my case the new nuts I needed were 6mm, but it would be a good idea to have nuts and washers in different small metric sizes. 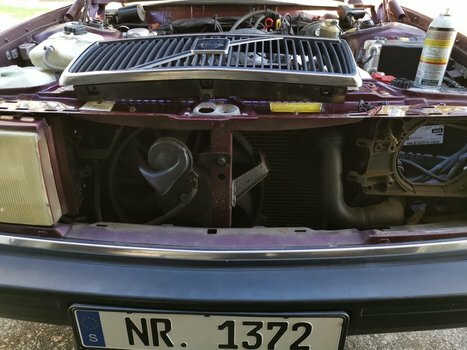 Enjoy the new clean face of your 240!